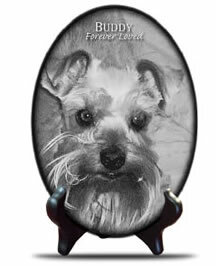 Engraved Photo on Marble 5 x 7 Oval. Easel not included. 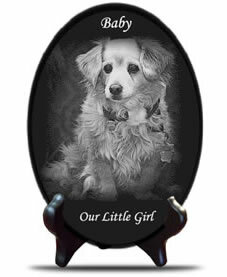 This personalized marble plaque has an image and text that is laser engraved into the marble. 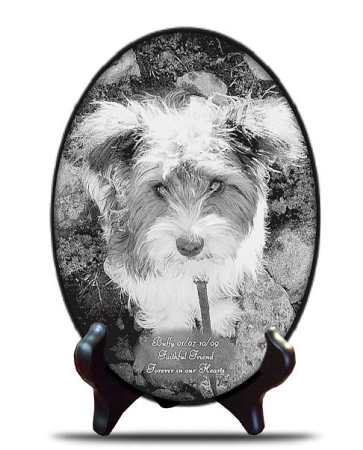 Designed for indoor display, this engraved marble plaque is ideal as a personalized gift, memento of a special occasion, a memorial plaque, or a recognition plaque. 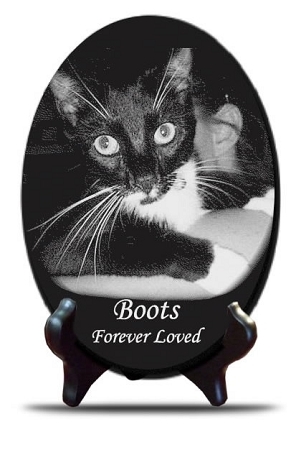 Dimensions: 7" x 5" (vertical) or 5" x 7" (horizontal) laser engraved marble tile. The marble is approximately 3/8" thick. The orientation of the marble will be determined by the image shape. Click the Image Gallery to view more examples. The customer service was very helpful. They do amazing work. I lost my best friend about 2 weeks ago. It was so hard. 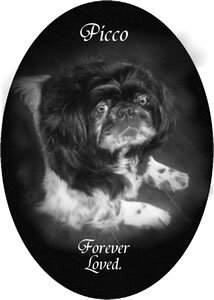 So, I found a photo of him and had it engraved on the marble. I have it displayed at work on an easel and can look at him (and talk with him). They did a beautiful job. It's so much better than just a photo in a frame. Photo Memorial Bench - When Tomorrow Comes..